Disturbing news through this morning from Aldeby Wines. 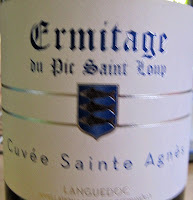 It seems that the good people at Ermitage du Pic Saint Loup only had a small harvest and all their wines this year have been allocated so there’s none available for UK retail. This is sad, however, I guess it does provide an opportunity to try some other wines, and Aldeby can help with that.